I realised when reading an article in the most recent issue of People Management that I'm still (at least) 25 years away from retirement as we understand the concept now, and therefore am not even halfway through my working life. That's a scary thought even if it is Halloween today. Here's the article that prompted my thinking and this blog post anyway. Basically, I realised how outdated my thinking and some organisational thinking is about the whole concept of employment and careers. Recently I've been talking to colleagues in my organisation about becoming Fit for the Future, looking at how we become the employer of the future. In doing so I drew comparisons with what it was like when I started work at ICI in 1986 and highlighting how different the world and concept of work is 19 years later. I was trying to get them to imagine how different work might be in another 19 years, but only a few grasped this with any clarity and most could only conceptualise to the end of their own careers in the next 5 years or so, and couldn't envisage any major changes. So we often talk about 2020 and having 20:20 vision. But I'm still going to be in the workforce at 2040 and I'm trying to change peoples ideas and concepts about what working life may be like then, and in particular from an HR perspective what employment arrangements might look like. The world of work my children enter in 10-15 years time will be almost unrecognisable from that I entered in 1996, but it's being shaped largely by people whose ideas of work and employment are based around that imparted by their own parents and shaped by their own experiences in the last 20 years or so. It's like we are reacting to events rather than proactively planning a future for our children to work in and finding out what they want. I work a lot in the housing sector and it's not unreasonable to expect a house built now to last 100 years, and for the main components within the house (kitchens, bathrooms, electrical wiring etc) to be replaced 5 times in that lifespan. So organisations working in housing are good at thinking long term from a customer perspective and product perspective, but with the average career now lasting around 50 years I am finding few people in any sector are planning for employees lasting that long. As Jo Faragher points out in her article, the concept of permanent work is on the decline. Interim contract usage is up 93% in recent years, and 6% of the UK workforce work on temporary, interim or other fixed term contracts. Non permanent staff are an integral part of organisational workforces and for many it's a way of life that suits them and still allows them to be engaged and embedded. Indeed, the article comments that some agencies have now started paying their contractors for "bench time" in between assignments, something I think may catch on. With a range of contractual arrangements now on offer from some organisations, it may be time to revisit the old Atkinson Model of the Flexible Firm that I remember from my studying and teaching days. 15 years ago it was an idea probably ahead of its time, but very perceptive and one that has accurately foretold how work will evolve, and will continue to evolve in the coming years. 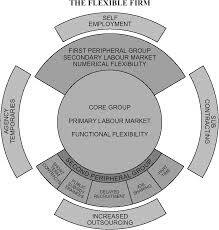 Organisations will increasingly operate on a model that has a minority of core, permanently contracted workers, and a majority of flexible and peripheral staff who give their all whilst working for that organisation, but who are not tied to that organisation or the need to work full time and build a 50 year career. This idea redefines what work actually is and celebrates the diversity of working arrangements that can be implemented. The UK is due to fall off the workforce cliff by 2021, so if we are going to remain competitive then we need to attract the best of the younger workforce, retain the best of the older workforce AND appeal to the one fifth of the UK population who aren't economically active but could be. Tall order, and it's a good job I've already lost my hair. But it strikes me that the best way of doing this is to offer different working arrangements. Different times yes, different contractual ties too and different terms and conditions to suit. But I don't see many organisations adapting and evolving in such a way, and many see the employment relationship as an exclusive one in a very old fashioned way. Why can't workers have relationships with lots of organisations? I also think that organisations need to think longer term in terms of their attraction strategies. This goes beyond community management (alumni, referral schemes, apprenticeships, partnerships with local colleges, social media groups and customer interactions) which is a good recruitment practice in and of itself, but looks at what the majority of workers due to ENTER the workforce in 10 - 15 years time actually want. This may sound daft, but that involves talking to children of primary school age and building links with them before they reach the age of 10, not just when they're in college or university - by which time its too late. Thinking about it, football clubs are amongst the few organisations that DO do this. When my son used to play under 8s football there were scouts there watching from professional clubs, and having spoken to a few of them they always stressed the importance of spotting talent aged 6 - 7, and nurturing that talent over a 10 - 12 year period before they could actually employ that individual and get something productive back from them - and that if a child hadn't been "recruited" by the age of 8, they knew they'd never make it as a professional footballer. But aside from football clubs, what businesses follow this pattern and actively engage with the talent of the future 10 - 12 years before they come to work for them? Maybe we should. Maybe we'd find out a bit about what they want us to do for them when they DO work for us. What hours they want, what pay they want, what benefits and what engagement. I think we'd find that very few expect to work the way we, their parents and grandparents, work. And even fewer have a concept of being engaged with and tied to one organisation on a permanent basis.